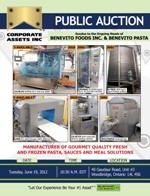 Corporate Assets Inc. | Benevito Foods Inc. & Benevito Pasta - Corporate Assets Inc. FEATURING: Manufacturer of Gourmet Quality Fresh and Frozen Pasta, Sauces and Meal Solutions. CFIA inspected and HAACP & GFSI Certified Facility to Include: High end production machinery and product lines to manufacture 16+ Gourmet Italian and international Fresh and Frozen Pasta, Sauces and Meal Solutions from 300 g to 1 kg formats; Machinery & Equipment to include: (3) ITALPAST (2002) complete pasta lines; bagged sauce line; (3) CAVECO (2011) packaging and entree lines; (7) LOMA IQ pass-through metal detectors; H-TECH (2001) 3000 kg/hr spiral freezer; G&F spiral freezer; AGNELLI formers and sheeters; ITALPAST pasteurizer and cooler; MULTIVAC MAP packaging lines; (5) CLEVELAND/HAMILTON kettles and glycol system; walk-in cooler and freezer; silos; CHERRY BURRELL heat exchanger; "LUNCHBOX" well established, patented product line for sale; CFIA inspected and HAACP & GFSI certified facility available for lease takeover (7 year + 5 year option) and much more.